This screen is accessed from the back-end Joomla! administrator panel. 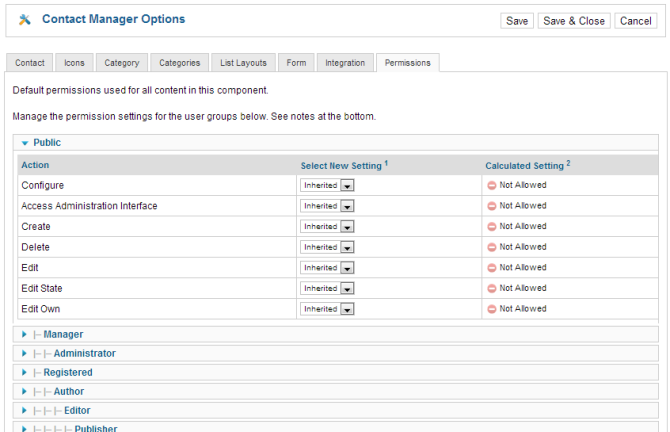 It is used to manage contact categories in your Joomla! website. 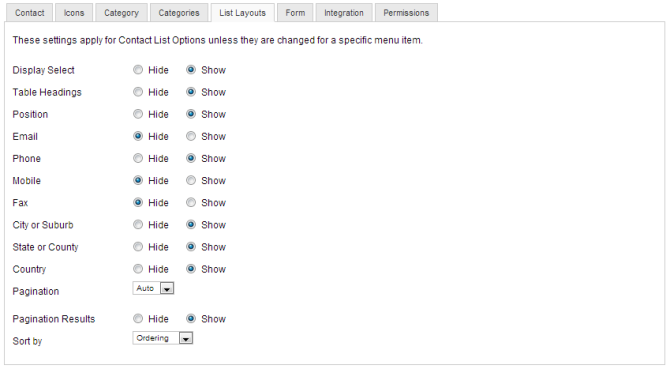 Select Components → Contacts → Categories from the drop-down menu of the Joomla! Administrator Panel. You can also select the 'Categories' menu link from the Contact Manager: Contacts screen. 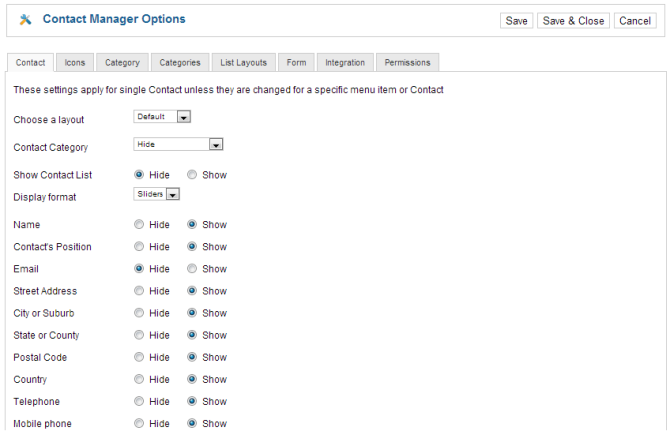 The Contact Category Manager is where you can edit existing Contact Categories and create new ones. 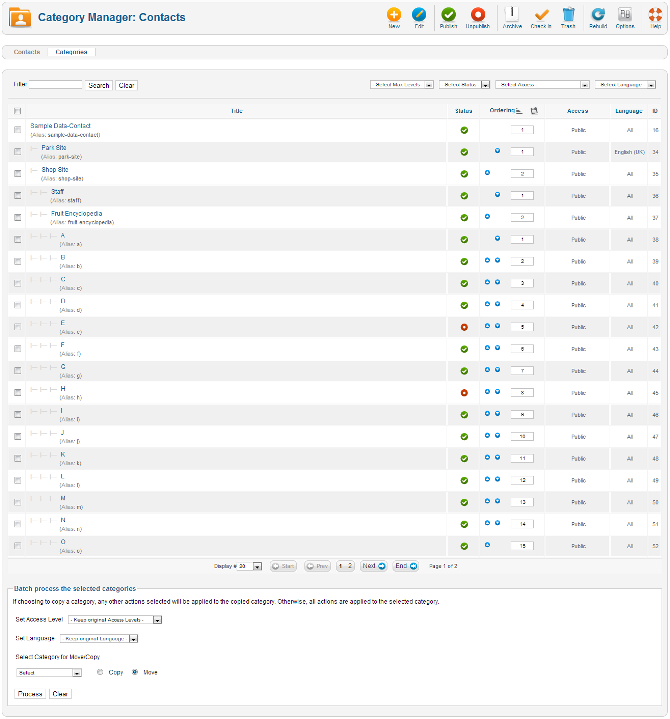 Note that Contact Categories are separate from other Categories, such as for Articles, Banners, News Feeds, and Web Links. From this screen, you can also navigate to the Contact Manager: Contacts screen. Set Language. Use this drop-down list to select a language. New. Opens the editing screen to create a new contact category. Edit. Opens the editing screen for the selected contact category. If more than one contact category is selected (where applicable), only the first contact category will be opened. The editing screen can also be opened by clicking on the Title or Name of the contact category. Publish. Makes the selected contact categories available to visitors to your website. Unpublish. 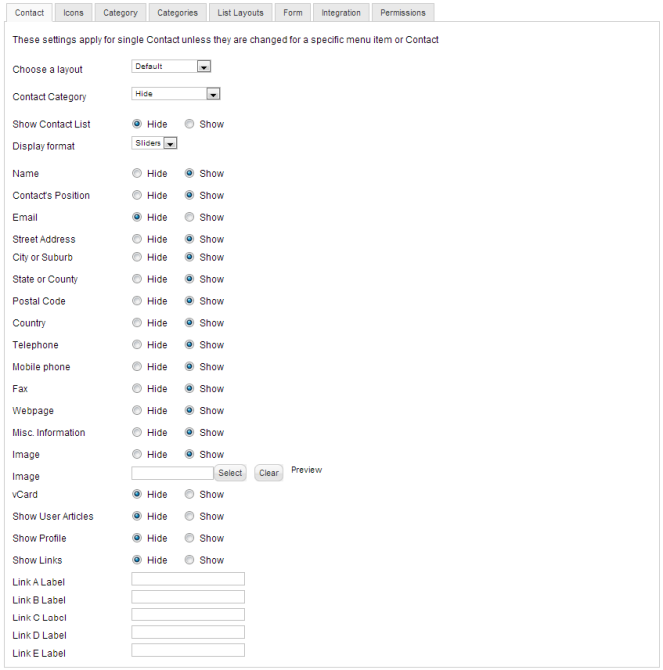 Makes the selected contact categories unavailable to visitors to your website. Archive. Changes the status of the selected contact categories to indicate that they are archived. Archived contact categories can be moved back to the published or unpublished state by selecting "Archived" in the Select Status filter and changing the status of the contact categories to Published or Unpublished as preferred. Check In. Checks-in the selected contact categories. Works with one or multiple contact categories selected. Trash. Changes the status of the selected contact categories to indicate that they are trashed. Trashed contact categories can still be recovered by selecting "Trashed" in the Select Status filter and changing the status of the contact categories to Published or Unpublished as preferred. To permanently delete trashed contact categories, select "Trashed" in the Select Status filter, select the contact categories to be permanently deleted, then click the Empty Trash toolbar icon. Rebuild. Reconstructs and refreshes the contact category table. Normally, you do not need to rebuild this table. This function is provided in case the data in the table becomes corrupted. Save. Saves the contact options and stays in the current screen. Save & Close. Saves the contact options and closes the current screen. Choose a layout. Default layout to use for articles. These settings apply for Contact Category Options unless they are changed for a specific menu item. Choose a layout. Default layout to use for the contact category. # Contacts in Category. (Show/Hide) Show or Hide the number of Contacts in category. State. Show or Hide a State column in the list of Contacts. Change an contacts state (Publish, Unpublish, Archive, and Trash) in the component. Edit existing contacts in the component that the logged in user has created. Contacts. Click this link to go to the Contact Manager: Contacts screen. Categories. This link takes you to the screen you are currently on. This page was last modified on 11 March 2013, at 07:05.